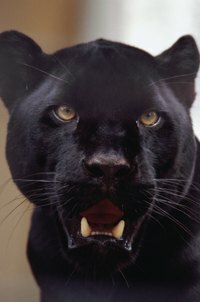 Black panthers are thought to be the most intelligent species of large cat. Their appearance is much like other large cats and smaller domesticated species, making a panther an easy costume choice for the feline enthusiast. Using items from around your home or the local costume supply store, you can create your own black panther costume for Halloween, a costume party or a school play. Cut the leg off a pair of black opaque tights; stuff the leg with cotton batting. Once the leg is stuffed firmly, tie the end in a knot. Use a safety pin to attach the leg to the waist of a pair of black sweatpants in the center of the waistband to create the panther’s tail. Cut two 2-inch triangles from a piece of black felt. Round the top points of the triangles to create the shape of a panther’s ears. Hot glue the triangles to a black headband, at the 2- and 10-o’clock positions, pointing outward from the headband. If you cannot find a black headband, spray paint one with black paint. Let the paint dry for 24 hours before attaching the ears. Wear the black pants, a black turtleneck shirt, black gloves, black socks and shoes. Slick your hair back away from your face using a comb and hair gel. If you have long hair, tie it back in a bun at the nape of your neck with a hair tie. If your hair is lighter colored, spray it with black Halloween hair color. Paint your face with black face paint. Cover your eyelids, neck and ears as well. For your lips, use black lipstick. Cut six 4-inch long pieces of florist wire. If the wire is not silver in color, spray paint it first. Let any paint dry overnight. Apply spirit gum to your cheeks and around the edges of your nose. Place three dots on either cheek in a 1-inch triangular pattern. Insert the ends of the florist wire into the spirit gum and hold the wires in position while the gum dries. If desired, wear green cat-eye contacts and cat teeth from a costume store to complete the look. Instead of using a sweatsuit, you can wear a black leotard and pair of black tights. and attach the tail to the leotard. Alternately, you can wear a catsuit for a sleeker look.